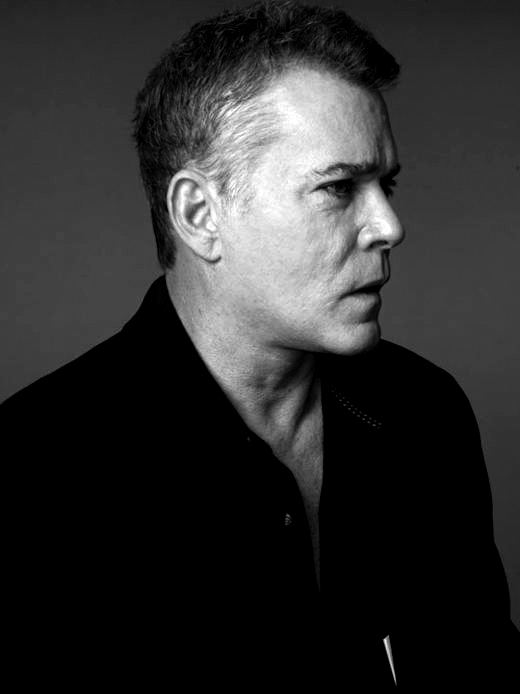 Ray Liotta. Portrait by Leslie Hassler. When you say the name Ray Liotta, the response is immediate and intense. Five years after playing "the nicest guy ever" on Another World, Liotta became internationally known for his ferocious presence and great depth as an actor. His role in GoodFellas catapulted him to stardom, but Liotta has taken great pains to keep his career from playing just one note. Roles like Corrina Corrina and Dominick and Eugene, have shown a tenderness in Liotta and explored how deeply layered his acting can be. In his new film, Snowmen, Liotta surprises yet again. Snowmen finds him playing a car salesman who does zany commercials to support his sick son. Liotta show us incredible comedic timing and then the pathos behind the humor. Upon seeing Liotta in person, the first thing you notice are the eyes. You could see them across a street. In a hurricane. At midnight. Arriving at the studio with his twelve year-old daughter Karsen, who is also in the film, Liotta shows a relaxed kindness towards children. When an assistant's son wanders in front of the camera while Liotta is being photographed carrying a toy plane, Liotta takes a minute to talk to him in a very gentle way. Although this could also be a ploy to get the attention off of himself. Like many of our greatest actors, Liotta seems less comfortable being Ray Liotta than playing some of his characters. But he humors us anyway. He talks about fatherhood, how an intimate knowledge of Jackie Collins can lead to Academy Award acting, and why playing Reggie in Snowmen has come as a welcome relief. Your daughter Karsen is here with you at the Festival, and in this movie, Snowmen, you play a father. How did this role come about for you? Liotta: One of the producers, John Shepard, his daughter goes to the same school that my daughter goes to. He got in touch with me, gave me the script and I really liked it. Rob (Kirbyson, the director of Snowmen) said he was thrilled he had gotten you for the role. Not only for your incredible acting chops, but for your humor. Are you secretly funny, Ray? Liotta: Well, it's pretty goofy some of the stuff I'm doing. My commercials, and things like that. Do you think your character has a level of pain, under his wackiness? It's hard to keep the relationship connected? Liotta: Yeah. Pretty much. Cause, you know, I'm just working all the time. I'm sure most families are like that, especially these days. Did you have anything in your life to draw from in this respect? Liotta: I don't work that way. There are things I've experienced, like the love and talking to a kid. You know, knowing your kid's pain. I make it a point to talk to my daughter as much as I can. Asking her questions, finding out things about school, who she's hanging with, she doesn't realize that I'm testing it. Just questions, wondering what's going on. You have kids? No, not yet. I'm a recent West Coast transplant. You now live in Los Angeles, do you like it? Liotta: I like it. At first you just equate it with hopefully getting work. I lived in New York for five years, I was on a soap opera, I did that and then I moved to LA when I was 25, 26. I always come back. My best friend from 3rd grade is coming, I'm still close with him. Now that you have a wonderful body of work behind you, what do you hope for? Liotta: To keep it going, I definitely had ups and downs and the business always seems to be changing, in terms of the types of movies that they're making. I've been working with Al Pacino, which was a dream. (Son of No One, 2011) I've been really lucky. Pacino, DeNiro, Gene Hackman, Robert Duvall, Anthony Hopkins. When I first started, I never wanted to do this, at all. I never wanted to act. Do you mean film acting? Liotta: Any kind of acting. Liotta: I had no idea. It just happened in college. I didn't want to go to college. My Dad said, "Go where you want, take what you want." I was gonna go, just liberal arts. Who knows, I could've been a PE major! But right next to the liberal arts was the theatre department. So I went and did that. And then you fell in love with acting. It sounds like you've worked with most of your heroes. Who inspires you now? Liotta: I really love that generation of actors (DeNiro, Pacino) I like the 70's movies, because that's when I really decided to get into acting. Once I got into it, I was just watching movies left and right. It was that type of film that really intrigued me. You have worked in every genre of film. How have you avoided only doing Italian-American dramas? You know how you do one Mafia film, and that's it for life? But that hasn't happened for you. Liotta: Yeah, but I still gotta fight through to get things done. I'll talk to my agents and there's still a perception that I'm too, "whatever" for films because of past movies. Hopefully maybe something like this'll happen. (Snowmen) That's why I jumped at the opportunity. Just to play somebody so goofy. Robert Kirbyson, director of Snowmen and Ray Liotta. When you look at all of your performances together, it's obvious that there is such richness in you, that you are not just one thing. Liotta: Oh, I hope. I hope. It's true, you can mention Corrina Corrina to some people and they burst into tears! 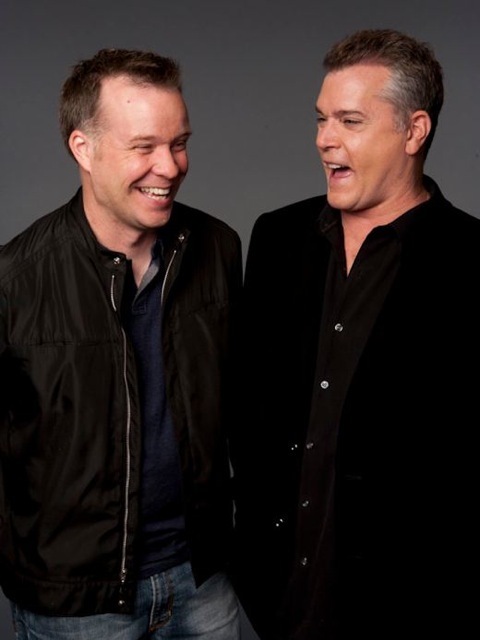 Liotta: Or Dominick and Eugene. Yes, Exactly. That's a perfect example. Liotta: But not a lot of people have seen those. Liotta: I think people remember bad guys. Even Pacino, who I'm working with. No one thinks of Author Author. It's the heavier characters. If you play a bad guy brilliantly, they remember. Speaking of memorable bad guys, Hannibal Lecter had you eat your own brain. I think many of us are permanently scarred. How do you play that? Liotta: It was horrible. First of all, I imagined that it wouldn't taste good. They asked me what I wanted to eat. I don't like dark meat chicken. At all. So, that's what they cooked. So when I was eating it, that was one thing. But I remember asking Ridley (Scott), "How are we gonna do this?" and he said, "I'm not sure either." And then I just started thinking that the best thing to do was---probably he'd have to give you some kind of anesthetic, cause it would kill you, so I just made the effect of the anesthetic that he gave me, just goofy. Just slow and goofy. What was it like working with Anthony Hopkins? Liotta: He was great. Easy. I think he was reading Hollywood Wives or some kind of crazy book when we were doing it, (laughs) some Jackie Collins thing. And then all of a sudden he would step in and be Hannibal. I like to work with people like him because you learn from them. There was such ease. Just total pretend. That he could be reading Jackie Collins and then one second later, be that guy. What have your learned from other actors you admire? Liotta: I remember watching Gene Hackman, or Robert Duvall. To just see them as actors. You think of them as these icons. But you see them mess up their lines, flub their lines, whatever, you just see the human being. But then when they're "in" it's totally about playing pretend. The game of it. Even though it's all pretend, great roles can really affect everyone, both the actor and the audience. Did you ever have a role that made you feel upset, even after the cameras stopped rolling? Liotta: Oh, Yeah! A bunch of them. Unlawful Entry. There were a few times after work where I thought to myself. What am I doing? This is too weird, too heavy. It's just not right. Liotta: I just remember that it's the game, it's pretend, that it's not real. And that it's not me. I don't feel the terrible way about certain types of people that my characters do. I have played some intense guys! You do something like Snowmen, you're working with kids and it's fun and it's nice but sometimes when it's too brutal it can be very uncomfortable. What do you draw from in your own life for your performances? Liotta: Nothing. Because if you're using your own life, you're limited. If you're playing someone without an experience that you've experienced, what good is it? You're still playing pretend. Liotta: I'm doing a movie now (Son of No One) with Channing Tatum, Tracy Morgan, Katie Holmes, she's really great in this. What makes you admire a performance? Liotta: It's just the commitment that they have, the playing pretend, the ability to so what the script calls for. You have incredible intensity about you. Where do you think that might come from? Liotta: I don't know. I feel passionate about things. And I feel things deeply, and that's always the way I've been taught, right from the beginning, that the deeper you feel something the better the acting.....and then it's also the person you're playing. If you're playing someone who's upset or yelling, that's what you gotta do. That's the job. People seem to have a really strong reaction to you. What is it like, when people come up to you and they have a relationship to you already? Liotta: Well, it's based on the work, obviously. I used to be on a soap opera, where I used to play the nicest character in the world. So sweet. Just from the beginning, at 21, I was in that public thing. There was a period there where things weren't happening, people would say, "What happened to you", "What have you been doing?" or not coming up to me at all--it's part of what this is. If you're not in the mood, you don't do certain things. It's not that big a deal. What do your parents think about your acting? They both ran for public office? Luckily, Liotta's millions of fans 'get it'. See Snowmen at the Tribeca Film Festival.